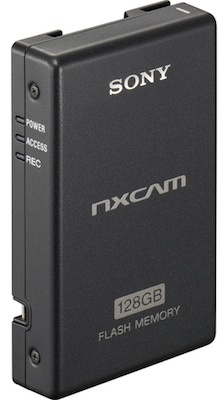 The Sony NXCAM 128GB Flash Memory unit is designed for use with the Sony NEX-FS100. This light-weight unit attaches directly to the camera via a slot behind the side handle. The flash memory enables the camera to record to two sources simultaneously (Flash memory unit and to SxS cards) for instant back-up. Provides approximately 10 hours of recording time on the highest quality setting. Has a mini-USB port to plug directly into a computer for immediate access to footage.